As you come out of the bedroom, immediately on your left (at the top of the stairs is the bathroom, (if you can call it that). It's the one room that we have done no work in, after ripping up the (soggy) carpet. It's a mess, stripped back to original floorboards, most of which we'll have to replace, and also a large chimney, which would've orginally been part of the oven in the kitchen downstairs. It's going to be a job probably for next year, but will be great to enjoy having a bath in nicer surroundings when it's finished! You can see the chimney immediately left of the door. Also the holes where we have taken off the hardboard door panel are clearly visible. Lucky to have the original glass underneath! 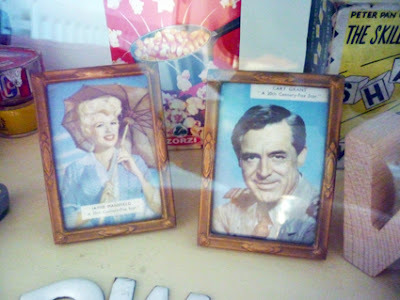 An ironic painting hung on the bathroom chimney. You can see that old 50's yellow colour that the bathroom used to be painted. 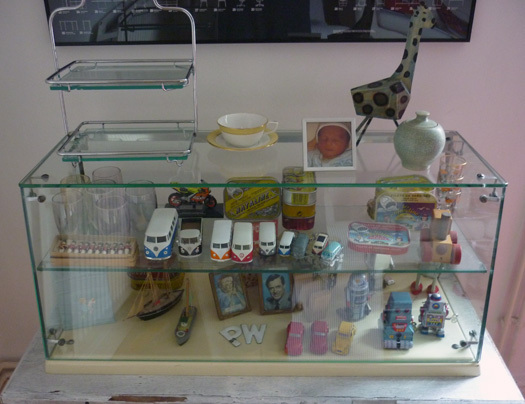 In a former life this glass cabinet was a shop display for cakes. It’s not particularly beautiful but it does have a certain oddness that I like. The display and choice of objects was never really planned, it’s more a case of what actually fits onto the limited shelf height; several objects are in groupings, namely the tin robots, boats, glasses, sardine tins, and D’s collection of VW camper vans. The photographs of Jayne Mansfield and Cary Grant are purely incidental, I bought the old frames from a market stall in Banbury, and these photographs were included, I have never got around to changing them, and have now become quite attached to Jayne and Cary – were they ever an ‘item’ I wonder? 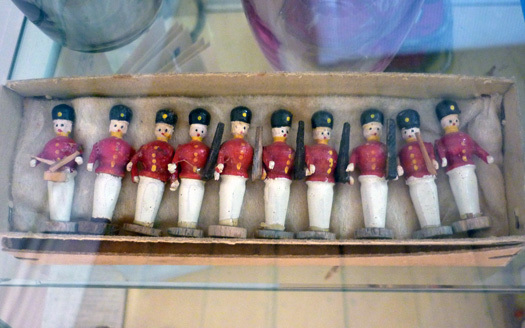 My favourite things are the set of ten wooden soldiers that I inherited from my grandmother; these were used to decorate my mother’s childhood birthday cakes, although we have no idea where they originated from – my great grandfather was a baker, so perhaps they were handed down?